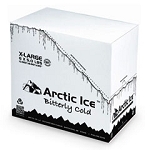 Arctic-Ice™ Tundra™ has a unique freezing point at 5°F and is designed to maintain a consistent freezer temperature in coolers. While not as cold as dry ice, Tundra Series™ can be used as a suitable replacement – it has been shown to maintain frozen temperatures for days in controlled testing. Due to its low freezing point, Tundra Series™ can take from 18-36 hours to freeze, depending on the temperature of freezer and number of panels being frozen. To ensure Tundra Series™ panels are frozen, the freezer should be turned to its lowest setting or at least 0°F. It is recommended that Tundra Series™ be used to maintain frozen goods, i.e. ice cream, meats, fish, etc. Use weight equivalent to dry ice normally used for great, re-usable results. Store panels in freezer so they are ready when needed. Tundra Series panels are also top rack dishwasher safe! For extended storage periods, the cooler should be packed full of frozen goods and rarely opened. 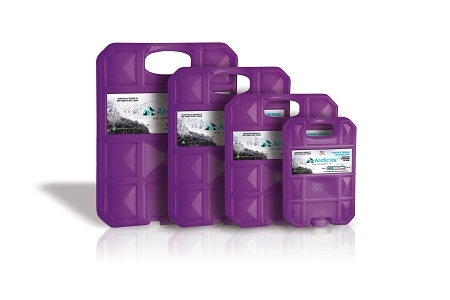 Arctic Ice™ Tundra Series (a dry ice alternative) is available in 4 convenient sizes. 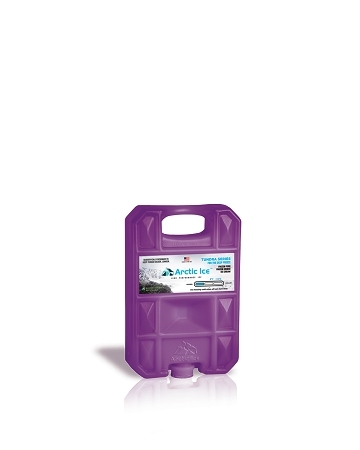 Small – .75 lbs – 4.25" x 6.25" x 1.25"
Tundra Series™ Small panels are great for keeping a small lunchbox sized cooler’s contents frozen for several hours. Add one or two of these panels to the frozen contents of a small cooler for best results. Pre-chilling and packing cooler tightly with little air will yield best results.